In the largest mobilization in the history of the youth global warming movement, students are rising up to demand immediate action to end our addiction to fossil fuels. Students on over 575 college and high school campuses across the United States and Canada are urging their campus administrators to enact clean energy policies as a key solution to the impending climate crisis. The demands are part of Rising to the Climate Challenge: Visions of Our Future, a week-long series of actions coordinated by the Campus Climate Challenge. “The Challenge” unites young people to win 100% clean energy policies at their schools. Anchoring the week of action are hundreds of screenings of the Oscar-nominated documentary An Inconvenient Truth. In partnership with The 11th Hour Project and Truth on Campus, the Challenge is making copies of the DVD and public screening licenses available to college and high school campuses across the U.S. and Canada. In addition to the film screenings, students are organizing rallies, educational forums and requesting meetings with members of Congress to urge that the U. S. take a leading role in reducing greenhouses gases. Events are planned in 49 states and 8 Canadian provinces. • Students at Rutgers University have collected 200 invitations sent to Rep. Frank Pallone D-NJ to at a screening and discussion of An Inconvenient Truth. The screening will also kick-off a campus-wide dorm competition to save energy. • Students from Ivy League universities are joining together to call for their campuses to go climate neutral. • January 30: Billionaires for Coal will be rallying outside the New York headquarters of Merrill Lynch to protest its investment in TXU, a company proposing to build 11 new coal power plants in Texas. • January 31: West Virginia elementary school students will be presenting letters to Governor Manchin urging him to build them a new school away from the coal silo that sits 150 feet from their current school. 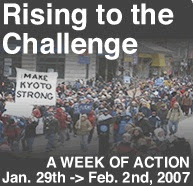 For a complete list of events during the week of action, please visit http://www.climatechallenge.org/woa. The Campus Climate Challenge, a project of the Energy Action Coalition, unites young people to organize on college campuses and high schools to win 100% clean energy policies at their schools. Energy Action Coalition is a network of 41 organizations from across the United States and Canada, founded and led by youth to help support and strengthen the student and youth clean energy movement in the United States and Canada. Energy Action Coalition partners are: Americans for Informed Democracy, Association for the Advancement of Sustainability in Higher Education, Black Mesa Water Coalition, Brower New Leaders Initiative, California Student Sustainability Coalition, Campus Progress, Chesapeake Climate Action Network, Clean Air Cool Planet, Climate Crisis Coalition, ConnPIRG, CoPIRG, Dakota Resource Council, Earth Day Network, Energy Justice Network, Environmental Justice and Climate Change Initiative, Global Exchange, Greenpeace Student Network, Indigenous Environmental Network, INPIRG, Kids Against Pollution, League of Conservation Voters Education Fund: Project Democracy, League of Young Voters, MarylandPIRG, MASSPIRG, MoPIRG, National Association of Environmental Law Societies, National Wildlife Federation’s Campus Ecology Program, NJPIRG, OhioPIRG, OSPIRG, Rainforest Action Network, Restoring Eden, Sierra Student Coalition, Sierra Youth Coalition, Southern Alliance for Clean Energy, Student Environmental Action Coalition, Students United for a Responsible Global Environment, Sustainable Endowments Institute, SustainUS, Utah Clean Energy, WashPIRG, WISPIRG, Young People For and Youth Environmental Network. Truthoncampus.org is helping colleges, universities and high schools across the country increase the positive outcomes from their screenings of “An inconvenient Truth.” Coordination is being led by Better Days Alliance, a Connecticut-based 501(c)(3) organization with support from Aveda, Annie’s Homegrown, Ben & Jerry’s Homemade, Clif Bar, Stonyfield Farm and the 11th Hour Project. This is great! I'm actually speaking at an event at a Beaverton, OR Middle School that's part of this Week of Action and doubles as a kick off event for the Focus the Nation on Climate Change movement. I strongly feel that the voice of people of my generation must be heard on this critial issue. Whatever we're dubbed (Gen Y, Gen Next, or whatever else), this generation of young people coming to age in the beginning of the 21st century will ultimetly be the ones who will live first hand with the consequences of the actions, or inactions, of our elected leaders today. It is up to us to decide what kind of future we wish to live in, and to fight to ensure that that future is realized. If we don't make our voices heard, and demand represenation as a constituency deeply invested in the outcome of the current debates on climate change legislation, we will have noone to blame but ourselves if things don't go our way. I love to see these events going on at campuses and schools across the country. They will hopefully help us find our voice. I hope that in addition to leveraging their own campus communities, the people gathering at these events also look outward to the larger political landscape. We are at a momentous point in history today wherein we will craft the policies that shape the future we will inherit, and if we gather our voices into one, we have the power to shift the political landscape. Let's not forget the power of student movements of the past. It was organized and consistent pressure from student activists across the country that was crucial to the passage and ratification of the 26th Amendment to the United States Constitution in 1971, which extended the right to vote to 18, 19 and 20 year olds. If student activism can change the Constitution of the United States, it can shift the politics of global warming. I am currently kicking around ideas for ways I can help organize this growing youth climate change movement into focused political pressure on key committee members who will debate the seven or so climate change bills currently introduced in the House and Senate. Any ideas about how to go about that, or contacts you might have for campus activists, organizers, professors, etc. who might be interested in getting involved, please send them my way (you can find my email info in the sidebar for this blog).